The New England Patriots edged the Los Angeles Rams 13-3 in the lowest scoring Super Bowl in NFL history to claim their sixth Vince Lombardi trophy. Tom Brady became the first player to win six Super Bowl rings, all in partnership with head coach Bill Belichick, as the Patriots moved level with the Pittsburgh Steelers as the joint most successful NFL franchise of all-time. Rookie running back Sony Michel scored the game’s only touchdown midway through the fourth quarter as Sean McVay’s much-lauded Rams side fell short on the biggest stage. 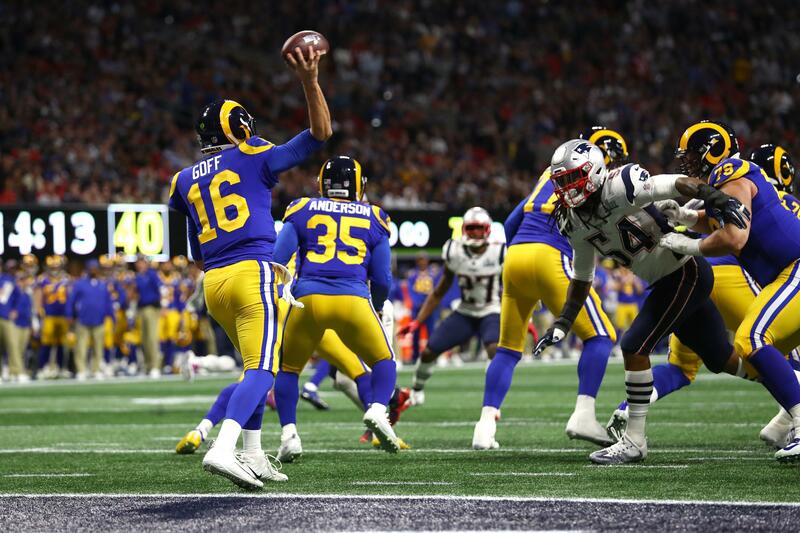 It was a first half dominated by defense, as young quarterback Jared Goff, playing in his first Super Bowl, struggled to get anything going on the Rams offense. Los Angeles managed just two first downs all half, with Goff completing only five passes and star running back Todd Gurley once again a peripheral figure, with only three carries for ten yards. The Patriots fared a little better, as Julian Edelman picked up six first downs as Tom Brady’s favourite target, but they too failed to create redzone opportunities, with Aaron Donald leading the Rams’ ferocious defensive line. 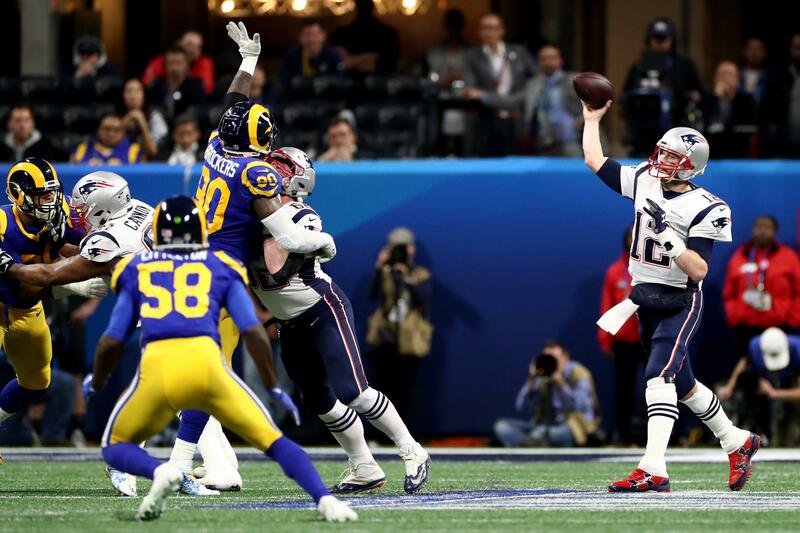 Only Stephen Gostkowski’s 42-yard field goal, coming after he’d missed from 46 yards, separated the teams at the break, with the 3-0 scoreline representing the second-fewest points ever in the first half of a Super Bowl. Gurley began the second half with a 16-yard run that suggested McVay may have found some answers during the interval, but it initially looked a false dawn as the Patriots defense continued to torment Goff, who looked lost. However, the Patriots lost Patrick Chung to a horrible looking arm injury, and in his absence at safety, Goff momentarily had Robert Woods open in the endzone for a deep heave, only for Jason McCourty to scramble across and make a brilliant touchdown-saving defensive play. From the same drive, Greg Zuerlein finally put the Rams on the board with a 53-yard field goal to level the scores heading into the fourth quarter. Edelman continued to be almost uncoverable, finishing with as the night’s MVP with 141 yards, but it was Brady’s 29-yard pass to find another stalwart, Rob Gronkowski, at the one-yard line that finally gave the Patriots a redzone opening, with Michel bursting up the middle for the first touchdown of the night off the next play. Goff almost floated an immediate response into Brandin Cooks in the endzone, only to see the pass broken up, but on the next play he panicked under pressure and threw an absolute gift of an interception straight into the arms of Stephon Gilmore. Huge runs from Michel and Rex Burkhead all but sealed the deal as the Patriots picked up crucial first downs, before Gostkowski’s 41-yard field goal with just over a minute remaining sealed the deal.